The generation of electricity in both nuclear and fossil-fired power plants involves important heat transfer processes: steam generators, heat exchangers, coolers, condensers, tanks, pipework, valves and fittings. Copper-nickel alloys are well-suited for these applications as they can be used successfully in clean seawaters with high total dissolved solids, brackish water, fresh water and cooling tower water. Copper-nickel alloys such as 90-10 Cu-Ni, 70-30 Cu-Ni and 66-30-2-2 Cu-Ni-Fe-Mn are commonly-specified due to their good resistance to corrosion and reduced macrofouling, as well as their heat transfer properties. In steam condensers, 90-10 Cu-Ni is often the first choice for the main body of the condenser. The 70-30 alloy is often used for the steam inlet zone and the air removal section where the environment is more aggressive. 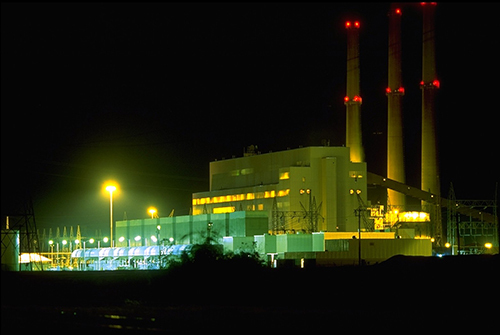 Erosion corrosion can be an issue at power plants, especially when sand or other abrasive particles are carried in cooling waters. 70-30 Cu-Ni is a better choice than 90-10 Cu-Ni to avoid erosion corrosion from abrasive particles. The 66-30-2-2 Cu-Ni-Fe-Mn alloy offers the best protection against erosion corrosion under these conditions. For oil cooler and the auxiliary cooling systems, the same alloys are considered as for the main steam condensers. For high pressure pre-heaters (feed water heaters), 70-30 Cu-Ni or nickel coppers (alloy 400) are preferred. They are normally used in the cold worked and stress relieved condition. Typical tube wall thicknesses range from 16 to 20 BWG. Although less common, copper-nickel tube has been used successfully down to 22 BWG, which, when suitable, provides the greatest heat transfer and economic benefit. There are many different piping systems within power generating plants and copper-nickel pipes and components can be used under suitable conditions. Offshore renewable energy involves offshore wind turbines and wave and tidal devices. The ongoing development of these industries offers new opportunities for the use of copper-nickel. 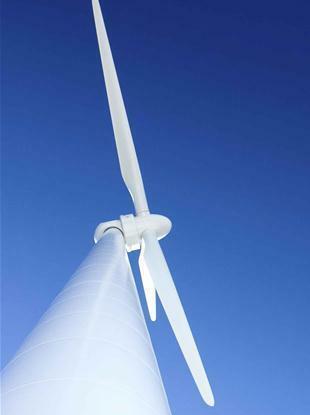 For offshore wind turbine towers and generators alone, applications can include boat landings, splash zone sheathing, cooling systems and J tubes. Corrosion protection and reduced macrofouling are essential requirements for towers and platforms within offshore wind farms. While cathodic protection is effective for the parts of structures continuously submerged in seawater, it is not effective in transition and splash zones where contact with seawater is not constant. Coatings can protect steel in these areas for a while but they are easily damaged and do not last for the expected lifetimes of the structures (i.e., 25 years). Ultimately, corrosion, marine fouling and high maintenance costs become problems that offshore wind farm operators must deal with. For these reasons, corrosion protection is a subject that increasingly requires attention as experience is gained under the harsh conditions encountered. 90-10 copper-nickel has proved to provide splash zone corrosion resistance as a protective sheathing on offshore gas platforms and can be an effective and low-maintenance cost solution for offshore renewable energy devices. Steel structures can be sheathed with copper-nickel either by direct welding onto steel or by insulating the sheathing from the steel to optimize its resistance towards biofouling. The sheathing has high resistance to uniform and localized corrosion, is not susceptible to stress corrosion cracking, does not embrittle in cold weather and remains free of heavy fouling.